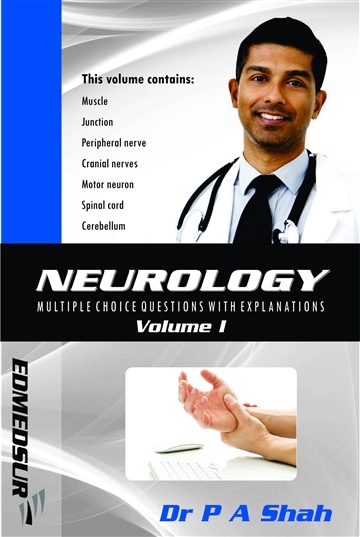 ‘Neurology Multiple Choice Questions with Explanations (Volume I)’ is meant for medical students, residents and other healthcare professionals. This volume contains 140 questions covering nerve, muscle, junction, motor neuron, cerebellum and spinal cord. Each question is followed by a brief discussion, answer and references. Uniqueness of this format ensures that the reader is able to view a logical flow i.e. question followed by explanation, answer and references. This allows the reader to have an un-interrupted flow and the reader does not need to move several pages to and fro. Volume II of this series contains questions covering epilepsy, stroke, EEG, acute confusional states, headache and related disorders. Volume III of this series contains questions covering dementia, Parkinson’s disease, brain tumors, CNS infections, lobar infections and related disorders.